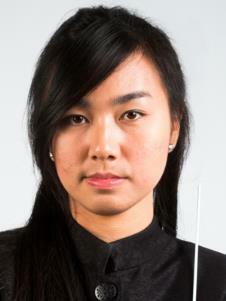 Pamornpan Komolpamorn has been appointed as an instructor of conducting department at College of Music, Mahidol University (MU), Thailand, since 2011, where she works as a director and conductor of the MU Symphony Orchestra, the MU Symphonic Band, the MU Concert Band, and the MU Brass Band. Her repertoire ranges from music of the seventeenth century to contemporary work and encompasses all genres: symphonic orchestral and wind,operatic, chamber and contemporary music. She has conducted ensembles in a number of different countries such as Italy, the Czech Republic, Singapore, Malaysia, Thailand, and the United States. She is a founded the Amass Chamber Ensemble (ACE), director and conductor since 2010, which has performed various composers and periods, early to contemporary music. Highlights of the 2012 to 2014 seasons include opera Strauss’s Die Fledermaus, and premieres by the three winners’ composers of the Young Thai Artist Award. She is currently a DMA student in Wind / Band conducting at the University of Texas at Austin, also she has been teaching assistant for Longhorn bands. Komolpamorn won the First Place winner for The American Prize in conducting,college/university band/wind ensemble division 2017-18. She appeared as a guest conductor such as the Nuova Orchestra AdM, Udine in Italy, to commemorate the 91st anniversary of the world premiere of the opera Il Tramonto' by Ottorino Respighi in 2015, the Thailand International Composition Festival since 2012, the Yala City Municipality Youth Orchestra since 2011, the Dr. Sax Chamber Orchestra, the Unity Symphony Orchestra, the Pesante String Chamber, the Bangkok Silpakorn Wind Orchestra, a community band, from 2009 to 2011 which she was appointed as a residence conductor, the Bangkok Youth Wind Orchestra, and the Thailand Philharmonic Pop Orchestra form For 2011 to 2014. She was also a tutor of University of Texas at Austin summer camp in 2017-18, She was an instructor of trumpet and guest conductor for the Dr. Sax Chamber Orchestra at Aum-Aree Music School. She was participated conduct with world master soloist such as Steven Mead, Steve Rosse, Paul Luxenberg, Misa Mead. Komolpamorn was an assistant conductor to Alfonso Scarano, chief conductor of the Thailand Philharmonic Orchestra. In summer 2018, Komolpamorn was invited to be assistant conductor of the National Music Festival (Chestertown, Maryland). In 2012,Komolpamorn worked as a producer and conductor on the Mahidol Symphonic Band releasethe CD recording on the title “Winds of Salaya” by the world premiere piece, Zurazak Ut-Za’s Of Faith & Reminiscences. She was also one of seven invited participants at the 2008"Tomorrow Musical Leaders", conducting workshop with Mr. Bundit Ungrangsee.Pamornpan was a guest conductor for the Project Unity Music Camp to conduct the Unity Orchestra with chief conductor, Mr. Bundit Ungrangsee.